A superior energy, endurance, and fat burning formula developed especially for first responders, SWAT teams and military elites is now being used by soccer moms to tackle the demands of daily life. When Dr. Dan Olesnicky developed SWAT Fuel, he had one goal in mind – meeting the exceptional physical demands of the police force, having served as S.W.A.T. team physician and police officer. After years of training fellow officers on nutrition and fitness tactics to support the superhuman endurance requirements of police, fire and rescue squads, it became clear that there was no supplement on the market powerful enough to do the job. Dr. Olesnicky was urged to create a special formula to promote optimal human endurance and energy throughout a grueling shift on the streets or on the battlefield. That’s why it came as some surprise when bikini models, moms, and office workers embraced SWAT Fuel as their own secret weapon to achieve their daily goals. Because SWAT Fuel is safe and effective for anyone who needs to maintain energy and stamina throughout the day, it’s become a mainstay for those in the know. It became clear that the need for an easy way to fight fatigue, utilize stored fat as energy and help maintain focus for a full 8 hours or more was a mainstream necessity in modern life. 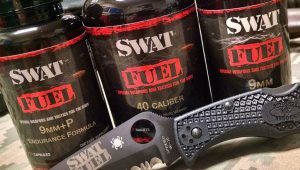 To meet that need, Dr. Olesnicky ramped up production of SWAT Fuel and expanded the line to include SWAT Fuel 9mm, SWAT Fuel 9mm + P for increased endurance, and SWAT Fuel 40 caliber to nourish the body with essential multivitamins. This complete regimen is available on SWAT Fuel’s new Shopify website, http://swatfuelstore.com. SWAT Fuel 9mm, the most popular product in the line, is sold for a very affordable price of $34.95 for 60 capsules. The thermogenic formula is the go-to pre-workout supercharger supplement for bodybuilding pros who need to power through extreme workouts and burn off excess fat stores. Thanks to Dr. Olesnicky and S.W.A.T. Fuel people from all walks of life, from teachers to construction workers, can benefit from these “Special Weapons and Tactics for the Body” once reserved for military and law enforcement professionals. SWAT Fuel, Inc. is a nutrition company producing professional-grade supplements designed to optimize human performance. SWAT Fuel supplements were originally formulated to support endurance needs of military and law enforcement elite special operations groups. Founder and CEO of SWAT Fuel, Dr. Dan Olesnicky, is a renown international lecturer and expert on weight loss, fitness, nutrition and emergency medicine. The post Swat fuel reviews – Press release launched August 10, 2016 appeared first on SWAT Fuel, USA Based Nutraceutical Manufacturer.